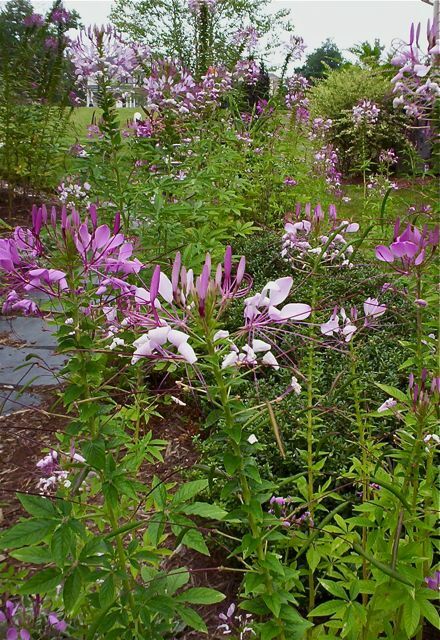 Since the beginning of the southern side garden ten years ago, Cleome or Spider Flower has been a summer staple. It self-seeds usually quite heavily but for the last couple of years, only a few cleome have emerged, probably due to heavy applications of mulch in spring. 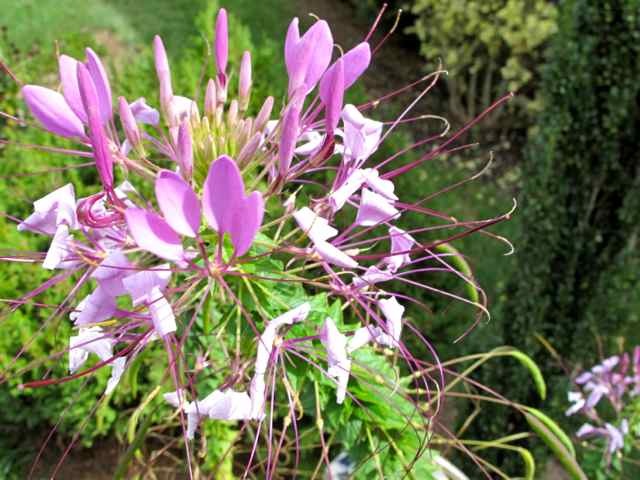 There are a handful of cleome now that were late maturing but worth the wait. 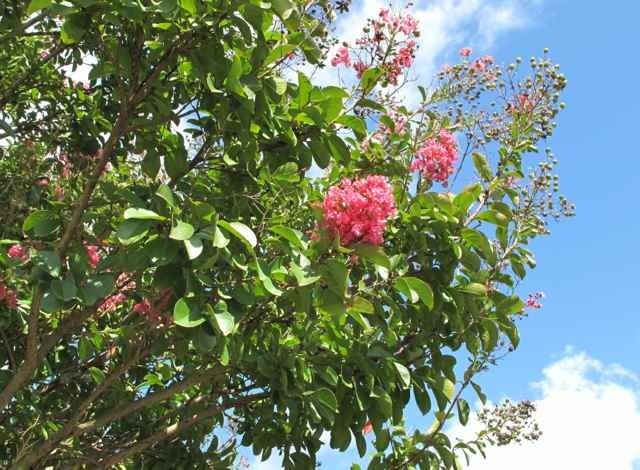 The striking flowers sit atop stalks that are five or six feet tall. 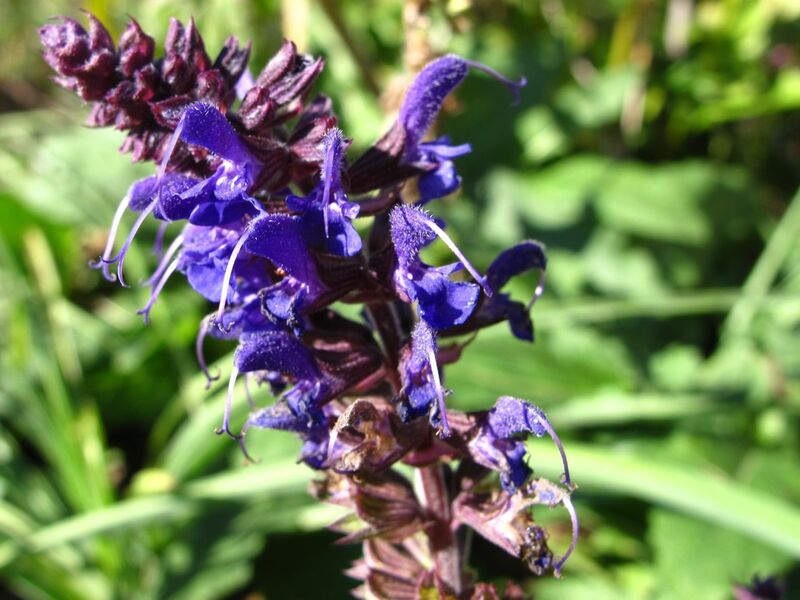 Meadow Sage provided some deep rich color early this spring, then took a break during the heat of the summer. Encouraged by refreshing rains and cooler temperatures, the meadow sage has returned this fall to fill the front of the northern border with spiky texture and deep indigo and burgundy tones. 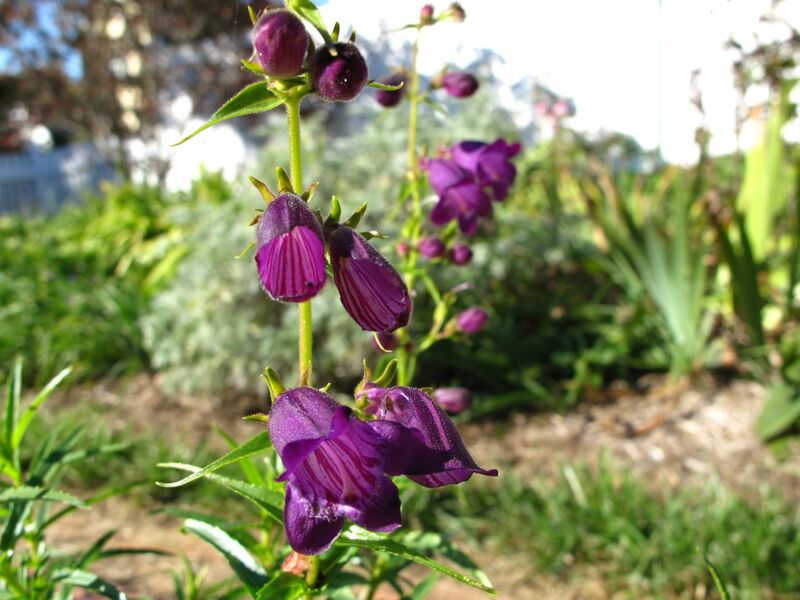 Added to the meditation circle in early June, Penstemon ‘Pike’s Peak Purple’ seemed like an ideal choice because the ‘Husker’s Red Penstemon’ had done so well earlier. It soon became evident this is a wilder, more scraggly plant that bloomed intermittently throughout the summer, but never was attractive. Today the flowers do look beautiful though. 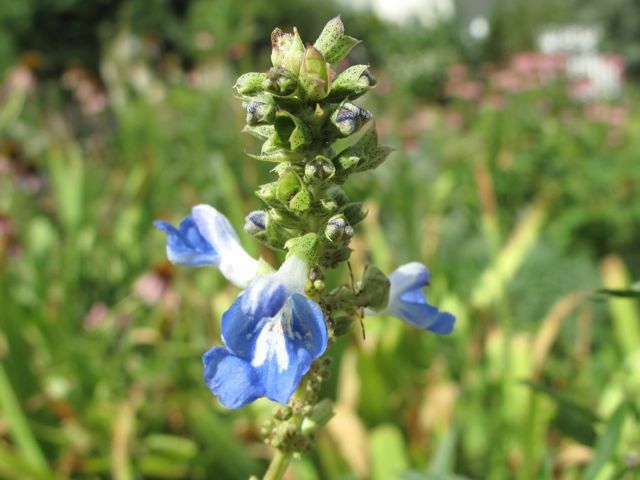 This entry was posted in garden and tagged cleome, meadow sage, meditation garden, penstemon on October 25, 2011 by pbmgarden. 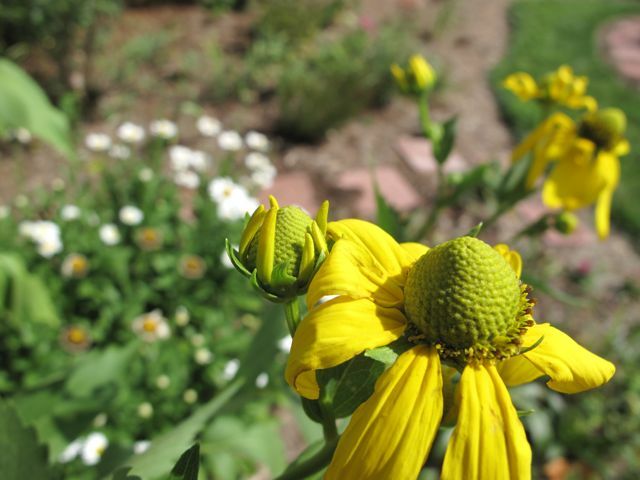 This completes a series illustrating the variety of blooms found in this garden in mid-September. Once extreme heat and drought set in during July the garden looked browned and parched. 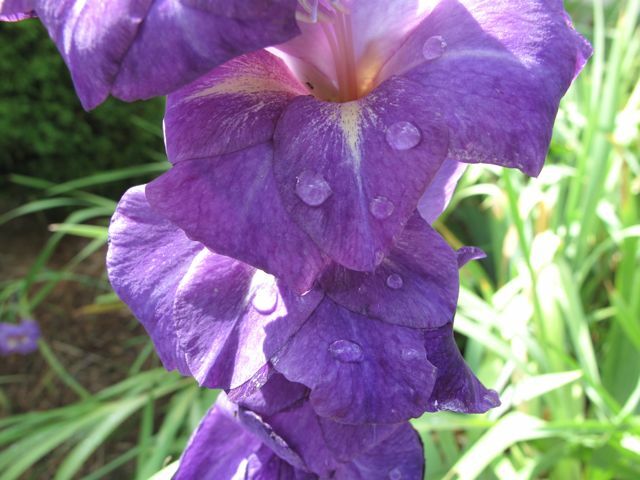 Now, eight weeks have passed with little maintenance, and the garden has awakened. Cooler temperatures and some key rainfalls have brought out a burst of blossoms. 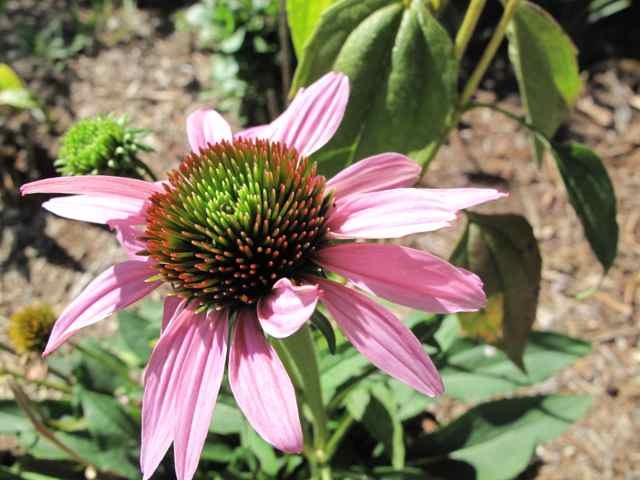 Echinacea (purple coneflower) is planted throughout the garden and these perennials have remained in bloom longer this year than usual. As the petals drop the seed cones provide food for the American goldfinches. Most of the Echinacea have dried up now and the brown stalks and cones are being left for winter interest and for the birds. A pair of pink dwarf Crape Myrtles at the front entrance took forever to bloom this year, while these Southern favorites were coloring the landscape all around town (and even in this neighborhood). The peak flowering period seemed to be about mid-August. 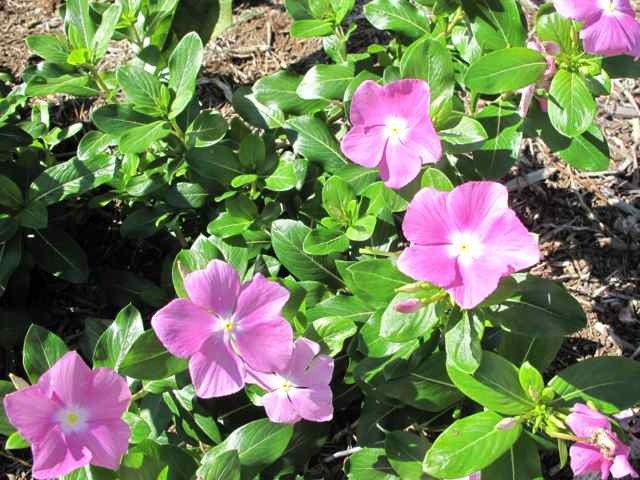 Because this annual is so commonly used, bringing it home was merely an afterthought at the garden center in early summer. During the worst of the dry, hot July days though, it added happy spots of color (both pink and magenta) to the border. 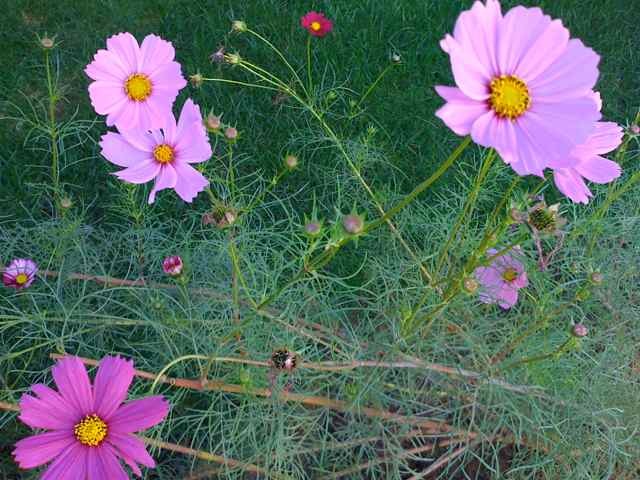 Only a few cosmos self-seeded from last year’s effort to fill the side border with feathery greenery and delicate blossoms. Usually these are very simple to grow but last year neither these nor the zinnia seeds produced a reward. The deer still graze down this side garden and seem to be attracted to the cosmos. 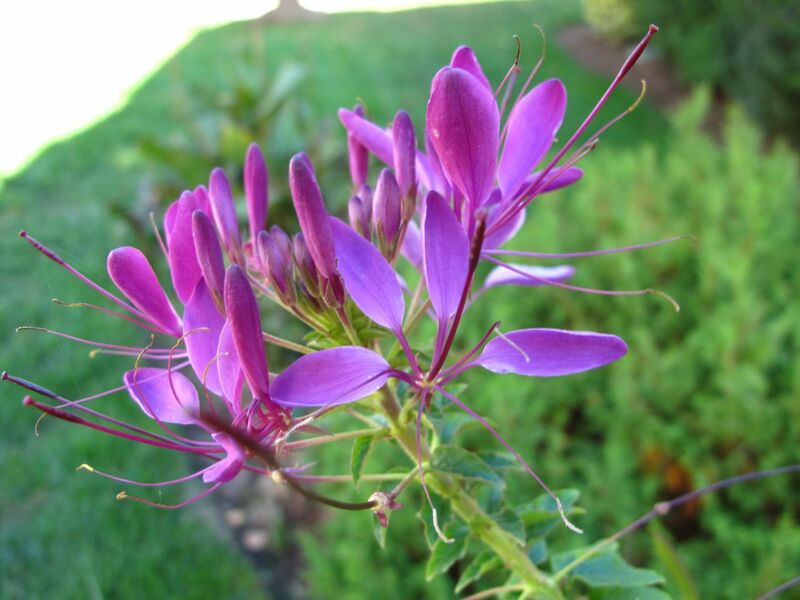 Cleome or Spider Flower is a magnificent accent in the border. The complex structure of the blooms and the long seed pods forming below the flower give this annual an architectural look. 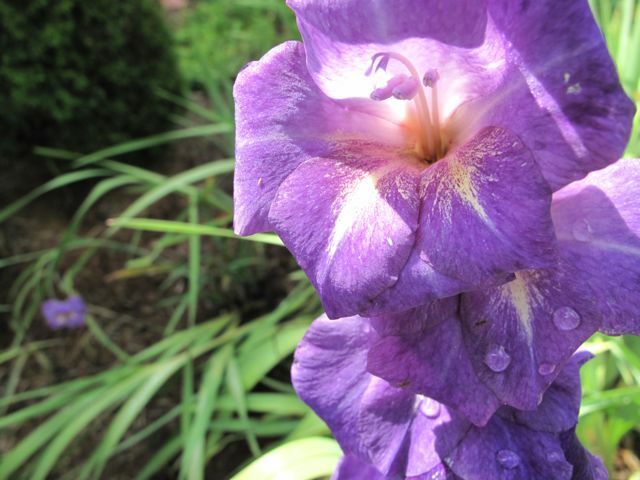 This is an old-fashioned flower that is remarkable. Ending the tour of blooms in this mid-September garden, there are several flowers blooming for there are no accompanying photographs, but they have been featured before: Pink Yarrow, Dianthus, and Verbena bonariensis. The pink yarrow bloomed profusely in the spring before browning in the heat. Only a couple of these are in bloom now. The dianthus was planted this spring and did well with deadheading though early summer before fading in the heat. It has revived somewhat but is not significantly showy. Verbena bonariensis, a tall plant with small flower clusters on long stems, has been blooming since mid-May. Yellow American goldfinches love them and love to sit on them, bending the stems eventually. Several new ones added to the garden in late spring survived. While this Asclepias tuberosa is not actually blooming now, the seed pods are interesting. 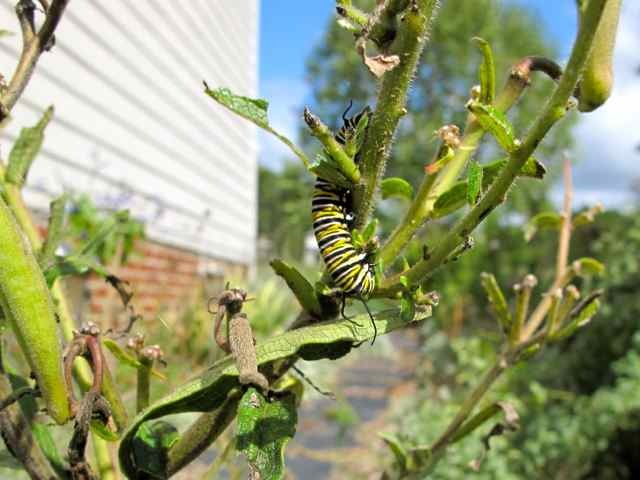 Milkweed is the host plant for the monarch butterfly. The caterpillar is feeding on the leaves and storing energy for the pupa stage. 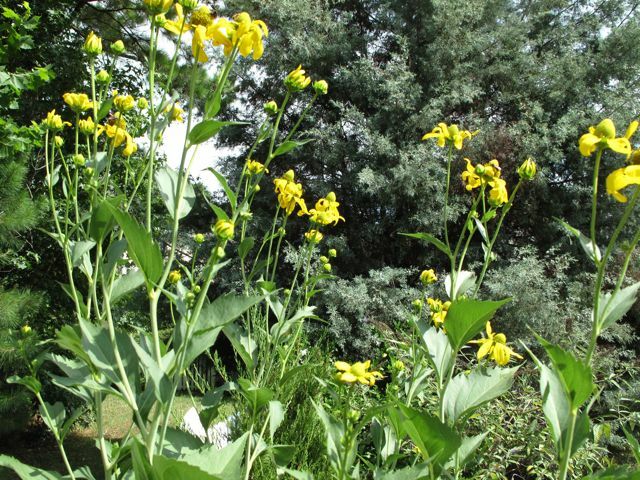 This entry was posted in garden and tagged asclepias, cleome, cosmos, crape myrtle, Dianthus, echinacea, verbena bonariensis, vinca, yarrow on September 20, 2011 by pbmgarden. For the past week weeding the garden beds has been a main focus of activities. There are other important tasks, such as pruning and transplanting to attend, but catching the weeds now will save labor later. This season weeding has proven to be as much an opportunity as a challenge, as it allows a chance to spend hours at a time listening to the birds and succumbing to moments of reflection. And sure enough, it is satisfying to see the results of of one’s labor! There is another pragmatic and immediate benefit of this week’s weeding. Mulch is scheduled for Saturday delivery and I want to inspect every inch of the beds to avoid stepping on or covering up emerging plants. 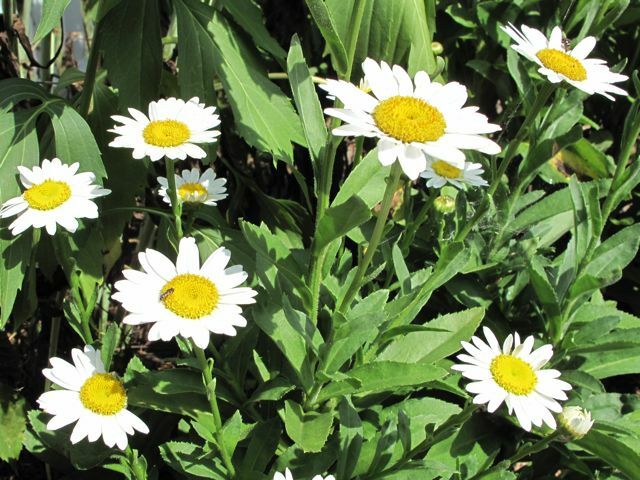 Lots of little seedlings were visible in the side garden yesterday, where last year’s largely failed project to fill the bed with annuals – zinnias, bachelor buttons and cosmos – occurred. This combination should have been a sure-thing, but results were disappointing. Some seedlings do appear to be zinnias. 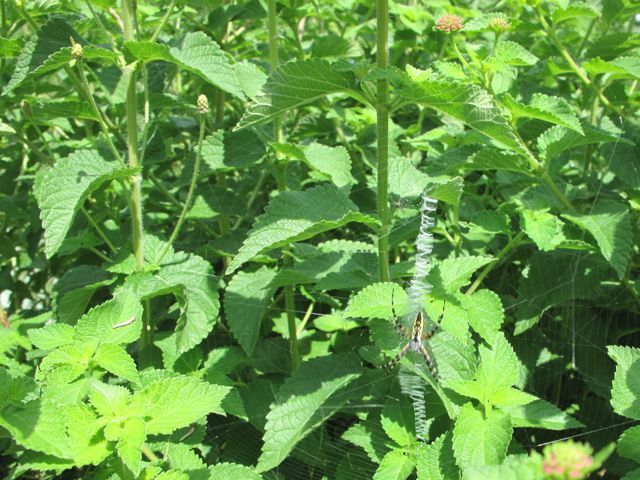 I will be on the lookout to protect any volunteering cleome (spider flower) as well, which in previous years had overflowed that garden bed. 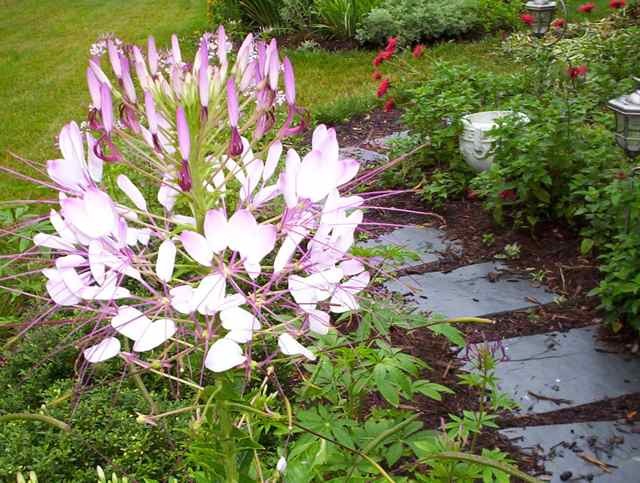 The cleome’s flowers are so appealing that for a long time it did not matter the cleomes eventually obstructed the path and dominated everything else. Disciplining plants is not primarily important in my garden when they offer reliably luxurious bloom and color, but eventually I took action to suppress the seeds. Now I hope a few of this old-fashioned plant survived. Originally they were passed along to me for my previous garden by a friend who purchased seeds during a visit to Monticello. Rain fell all night and at 7:15 AM it already is 56 degrees (on its way to 65). More rain and storms are predicted during the day, so there may not be much chance to weed today. It’s a sure bet the warming temperatures and last night’s rain will encourage even more weeds. Will the weeding continue to feel more like opportunity than overwhelming challenge? 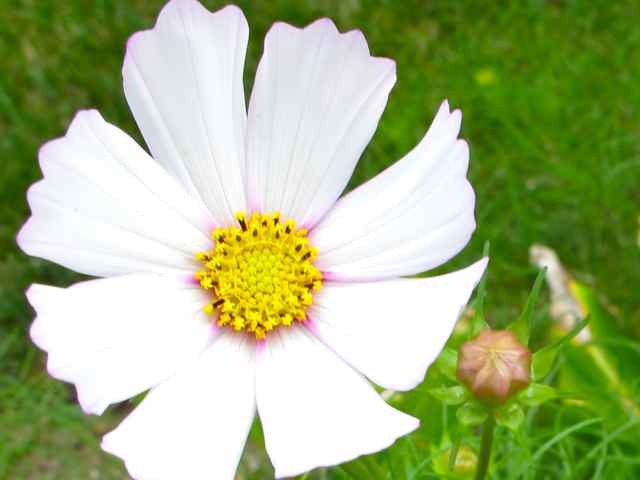 This entry was posted in garden and tagged cleome, cosmos, pass-along plant, weeding, zinnia on March 10, 2011 by pbmgarden.